A buyer persona is a representation of your various buyers and influencers. Basically, who is buying your product or service? Understanding these buyer definitions is critical not only to your content creation, but to your lead generation efforts as a whole. A persona uses data to help everyone that is creating content to focus on a tangible representation of a buyer, versus a nebulous, formless one. If a buyer persona is created without research and based on outdated assumptions and hunches, you can have a biased and incomplete view of who you are actually marketing to. Many marketing teams don’t back up their hunches with measurable evidence. Personas then take on the attributes of whatever the most important person in the room thinks they should be. The bottom line is the more you know about your actual buyers, the more you can focus your messaging and effectively target and speak to your audience. Sales: Your sales team understands better than most in your organization who buys your product or service. They speak to prospects day in and day out and know buyer pain points, objections, and what gets them excited. And they not only understand who your primary buyer is, but they also understand the influencers — those who may not make a purchasing decision, but who heavily influence your purchasers. Customers: Current customers are a fantastic resource. They have already purchased your product or service and can tell you a lot about why they purchased, what their pain points are, and what a day in their life looks like. You might consider offering an incentive like a gift card or T-shirt to the customers who participate in your survey. One thing to note is that you want to experience the good, the bad, and the ugly, so make sure you interview customers who have had a wide variety of experiences with your company. Prospects: You also want to focus on those that are considering your product or service. Who are they? What attracted them to you? It may be tough to speak directly to prospects because they aren’t customers yet, so use the data that you may already have in your customer relationship management (CRM) or marketing automation platform to determine who they are and what they do. What interested you about our solution? What are the pain points relevant to our solution? Which needs might our solution address? What are you looking for in a solution? What is your preferred buying process? How are you researching product/solution information? How do you typically choose to consume information? How often are you on a mobile device or tablet? Don’t have the time to do this type of research? You can always bring in a third-party consulting firm to do this for you. Invest the time upfront before you risk wasting time creating content that doesn’t make sense to or isn’t even noticed by your intended audience. Who: Provide a detailed explanation of who the buyer is and include demographic information. To aid in your storytelling, consider adding real-life characteristics and descriptions to your worksheet. Even give your persona a name! What: Include a detailed explanation of job responsibilities and day-to-day life. Pain points: List each pain point that you collected from your interviews. What are the issues facing this persona — what makes this person pull his hair out every day? Addressing these pain points will be great topics for your content pieces. Goals: What are your persona’s 2–10 year goals? How can your product help her get there? Wish lists: What does this person wish for? What are aspects of your product that can help your persona achieve his wishes? Buying profile: Describe how this person buys. Can you often find her on Twitter searching for reviews? Or maybe this person asks his friends for advice. After you have developed your buyer personas, you can start writing content that is applicable to their needs and profiles. 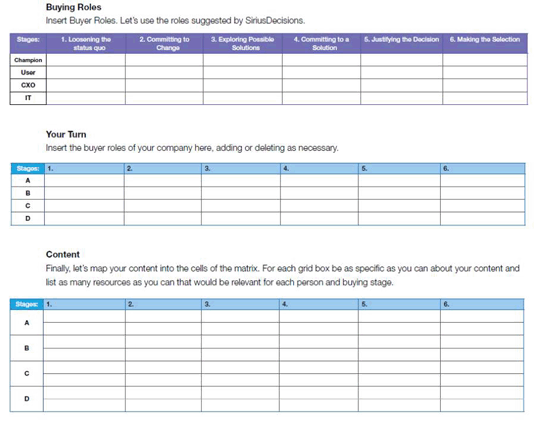 Keep your buyer personas in mind as you create your content marketing plan.